Rev. William C. Mayer, CSV, died Sat., Dec. 9, 2017 at Addolorata Villa in Wheeling, IL. He was preceded in death by his parents Albert and Ruth and by his two sisters, Patricia Haarer and Kathleen McEvilly. He is survived by his dear friend, Sr. Clare Fitzgerald, SSND, PhD of Boston, MA. Fr. Mayer professed his first vows on Aug. 19, 1947 at the Viatorian Novitiate in Chicago and his final vows on Aug. 19, 1950 at St. Joseph Church in Springfield, IL. 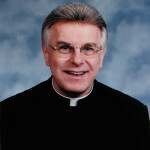 He was ordained to the priesthood on Feb. 4, 1956 at the Shrine of the Immaculate Conception in Washington D.C. He attended his freshman year of high school at Cathedral Boys High School in Springfield, IL and graduated in 1945 from St. Patrick High School in Kankakee. He received a BA in Philosophy in 1951 from St. Ambrose College in Davenport, IA, an MA in Sociology/Catholic Social Principles in 1956 from Catholic University of America in Washington DC, and an MA in Religious Formation in 1971 from Manhattan College in New York City, NY. In addition, he earned an All Grade Supervisory Certificate for the state of IL in 1967 from DePaul University. Fr. Mayer taught high school at Spalding Institute in Peoria, IL (1956-1958), at St. Philip High School in Chicago (1958-1960), at his alma mater St. Patrick High School in Kankakee (1960-1966), at Bishop McNamara High School in Kankakee (1966-1971) where he served as both teacher and administrator, and at Griffin High School in Springfield (1971-1978). He then turned to teaching adult religious education at St. Bede Priory in Eau Claire, WI (1978-1981), the Franciscan Spirituality Center in La Crosse, WI (1984-1986) and St. Mary and St. Eulalia Catholic Churches in Winchester, MA (1986-1991). 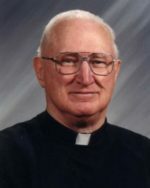 From 1991 to 1996 he continued teaching adult classes at the Church of the Holy Ghost in Wood Dale, IL, where he remained as a sacramental minister after his retirement to the Viatorian Province Center retirement residence in 2005. Visitation took place before a Mass of Christian Burial on Dec. 13 in the Province Center Chapel in Arlington Heights. Fr. Mayer was interred at Queen of Heaven Cemetery in Hillside, IL. Please remember Fr. 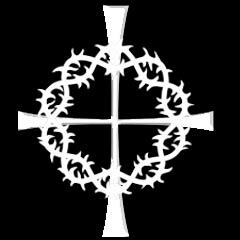 Mayer in your Masses and prayers.